L a Mar restaurant Lima is consistently rated in the Top 50 Latin American restaurants and is the creation of the famed chef Gaston Acurio. This seafood restaurant is located in my home neighbourhood and had humble beginnings; once upon a time it was home to a garage owned by my late father in law. I decided to take a visit with some of my family and friends to see what this restaurant is really like and perhaps find out why it rates so highly over the past many years in the food scene of Lima. On arrival you can expect to queue for a while and perhaps while you wait you can sample one of their famed Pisco cocktails. 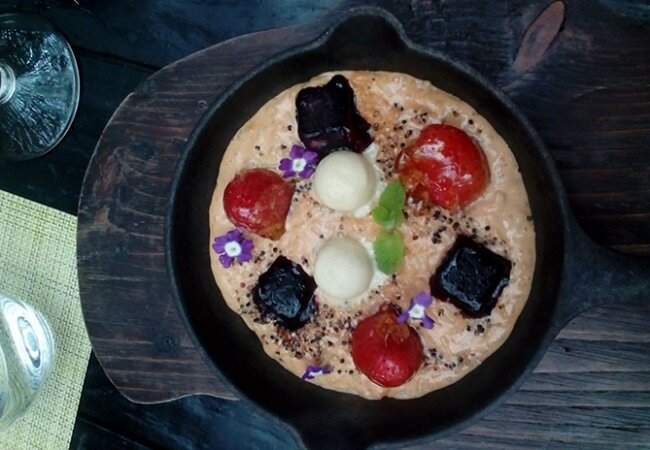 The immediate impressions are this is not a beautiful restaurant but it does offer a clean simplicity which is fortified by wonderful and attentive staff in a busy Limeño environment. 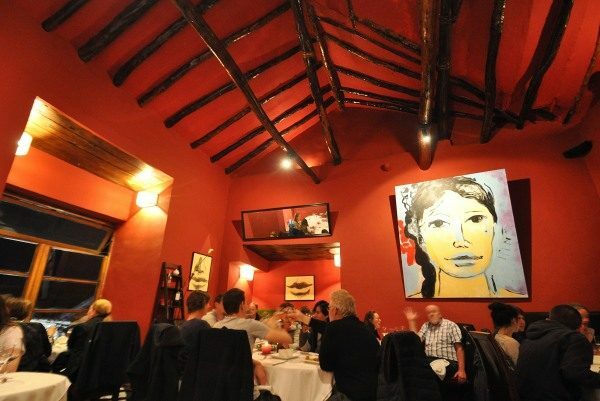 This restaurant is a true local restaurant too and not just the domain of wealthy tourists. On that note, it is an expensive choice but then is it worth the expense? We shall see! The La Mar Restaurant Lima setting has no sea views and the décor is functional; where it does excel is in the exemplary food creations from a bounty of daily food harvests from the nearby Pacific Ocean. Daily catches drive the menu in a sustainable manner and they offer simple food conjured into marine works of art for the taste buds. The menu is heavily influenced by seafood and if you are not a fish lover then this is not the place to be, as there are no other options. If are going to be adventurous in trying new seafood you are assured of fresh produce expertly prepared. Appetizers, piqueos and soups begin at around 50 Peruvian Soles (USD 16). The wine list is short but well-appointed with a selection of South American and European offerings and prices ranging from about S/110 to in excess of S/380 (USD 35 – 120) or more for some French Champagne, should you feel like a real celebration. I chose a wine from the Rias Baixas region of Galicia Spain. I have traveled there before and their native Albariño grape variety offers an intensely fruity and yet acidic combination, which for me is a perfect complement to seafood. Incidentally the waitstaff were all cheery and very responsive which is not always the case here in Peru. They genuinely seemed engaged in their work of caring for customers. A small oddity I noted and never witnessed before, was that after the waiter served the wine he took it away out of sight and returned with the bottle as top ups were required. When asked he said this was good practice. I would have preferred the bottle on ice in view aside the table. The selection of main courses at Lar Mar Restaurant Lima runs to many pages on a journey of the Pacific Ocean and prices average about S/80 for a main dish. I chose a fillet of Corvina, a fish native to these shores, similar to a Sea Bass. 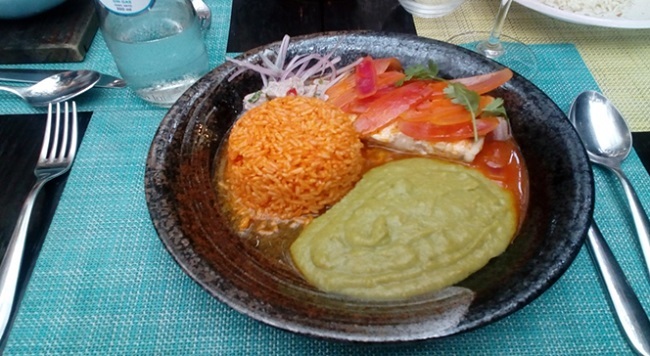 The dish called Lomo de Corvina a la norteña has a base of a delicious boneless fillet marinated escabeche style in vinegar and colored with saffron and yellow rice. It did not disappoint and the flavors are spellbinding in complexity. 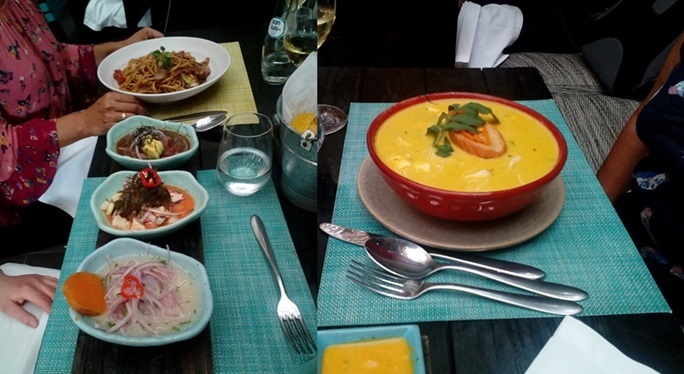 We also had a Tres Ceviches dish and a Chupe de Pescado a la Limena (fish chowder) which were equally impressive in their textures and array of flavorsome combinations. Desserts are on offer for about S/30 (USD 10) and I tried the Combinado which included quinoa pudding with cinnamon glazed strawberries all bedecked with a colourful presentation and tasted as good as it looked. 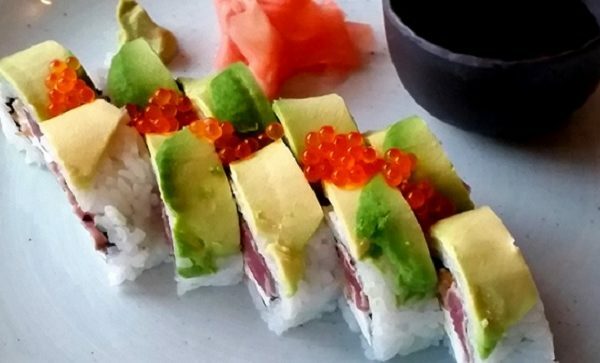 La Mar Restaurant Lima: Is it worth a visit? There is no definitive answer here. What do you value in a lunchtime restaurant? If it is things like local food at an accessible price for daily eating the answer is a resounding no. 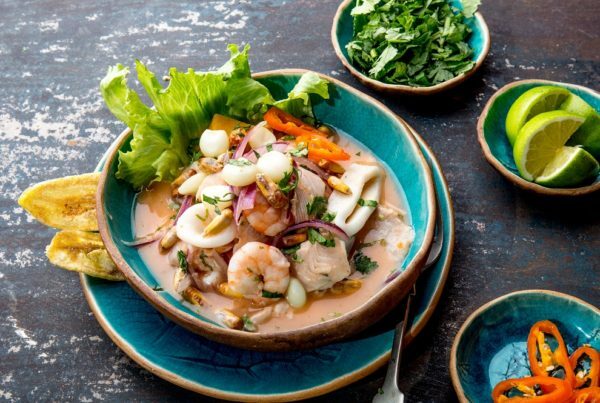 The prices are high and there are a host of other cevicherias in Miraflores that will challenge for the top prize in seafood. Within walking distance are El Mercado and Santo Pez on Avenida a La Mar. 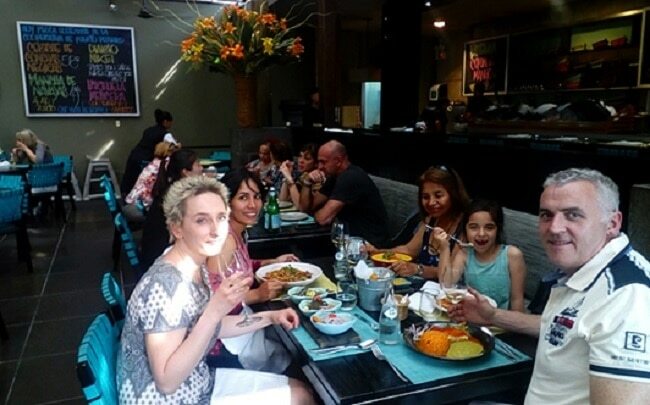 In Miraflores center too you have Punto Azul restaurant as a challenge and also the more rugged and local Costa Azul just a few blocks away from the center of Miraflores. A future project might be to compare these restaurants but for now I do think La Mar is overpriced, that’s my honest opinion. Maybe it’s just me, but for a considerable outlay I expect great food wrapped in great and sumptuous surroundings. The surroundings all add to the experience and for me La Mar restaurant Lima fails to deliver on this expectation. So then, what of the good points. The staff were excellent and attentive and the variety and extensiveness of the menu is in itself an attraction to seafood lovers. The dishes which we sampled were truly exceptional in their flavours and for that alone I think they represent value for a special occasion. This alone makes a visit for a special occasion a must, as what price do you place on something unique that you will never experience in another place? Would I go again? In all honesty probably not; as I think they have serious competition in seafood fare in Miraflores. Perhaps they have sailed on for too long on the sea of kudos and might do well to reflect on offering true value to clients. Watch out for pirates to take your money when it comes to paying you bill in these waters of Miraflores! Even the preeminent leaders of gastronomy like La Mar Restaurant Lima fall, eventually; becoming what’s known as a successful failure! You can take a taxi from the center of Miraflores and it takes just ten minutes and costs S/7. NOTE: They do not take bookings at La Mar and so first come first served.